On micro-sized islands where sea and water sports tend to dominate, it’s surprising just what a wealth of land sports are on offer in Malta. Cycling has taken off big time in recent years for example. Horse riding in Malta is less common a sport to see even if horses seem to be present on all roads from main arterial highways to country lanes. You’ll come across smartly turned-out competition trotting horses striding out (with traffic congestion behind) as well as slow-coach ponies and traps driven by old farming folk (with even more traffic biting at the bit to overtake!). Rarely will you pass horse riders out on a hack, but that’s not to say the sport is barely supported in Malta. 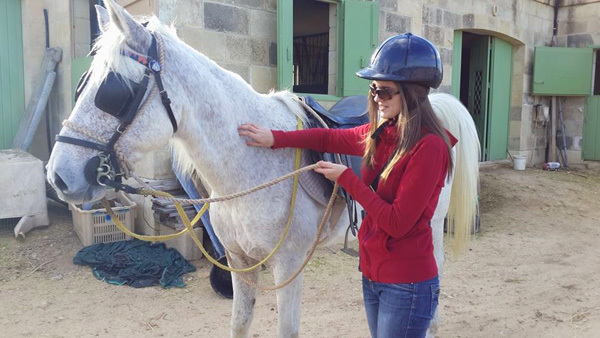 Malta Horse Riding has a list of the various stables offering tuition from beginner to serious showjumper and dressage levels. There are also several stables geared to ‘trekking’ and offering casual rides out for all abilities. These hacking stables are popular with tourists and some offer rides taking in spectacular scenery with coastal views. 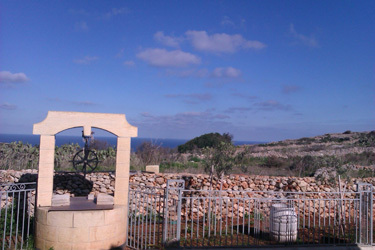 Maria Cremona got a taste of a trekking in Qala, Gozo, this spring. Here’s her review of what the novice rider can expect. Oh no, what am I doing? How did I ever convince myself to do this? Now would be a good time to turn around and go back home. Such thoughts were hatching in my head as my friends and I got out of the car on our way to the riding stables on the outskirts of Qala, Gozo. A big, black dog came up to us, sniffing our bags and looking curious. “Shoo, shoo, get away!” exclaimed Nicole. The dog followed us closer and closer, until we reached the front gate of the stables. This is not going to end well, my frantic brain said. We went into the stable. Charlie Muscat, our instructor and owner of the stables, was making some finishing touches to a big, white horse. It was huge but so beautiful. Now, when thinking about it, I recall the regal serenity in his eyes. As we stared at the horse, our instructor handed us the helmets. Mine was too small. Slowly, I went around, conscious of my every step. I put on my helmet and went outside with the others. There were two more white horses outside, saddled up waiting for us. “Well, come along!” said the instructor. This was not the first time for Danny. She quickly mounted the horse and sat straight up, smiling. Nicole mounted slowly. I could see her struggling to keep her nerves in check. Then Charlie brought out my mount, Benjie. At one point I remember putting my foot in the instructor’s hands, the next thing I knew I was up in the air on this majestic creature. “Sit straight, hands apart, hold on the reins like this, steer left or right if he’s leaning too much on one side,” said Charlie. Steer seemed a weird word to use. “And, more importantly, keep calm.” Easier said than done, I thought. I looked at him and pleaded: “Don’t leave me alone. This is my first time.” He smiled and patted Benjie, “Don’t you worry, you’ll have fun!” And off we went. With Benjie’s first sure steps, my fears were allayed and I planned to enjoy the ride ahead. Each step filled me with a calm assurance. Benjie, Yolo and Yoggie trotted slowly but surely through the rocky paths. Benjie was still new, the instructor said. Yolo was the leader, almost trying to overtake the instructor. Yoggie stood in the middle, looking back and forth for his comrades. Paths of all shapes and sizes wove through the countryside, taking us further into the greener part of Qala. We were approaching a hill. I couldn’t help but look back at my friends to see how they’d cope with the vertical incline. “On the way up, hold your backs straight and lean slightly forwards,” called Charlie. I grabbed the reins tighter but to my surprise, Benjie climbed the hill smoothly. His steady pace allowed me to share his confidence. With each step, I let go more and more of my worries and started to trust him. At one point, I stopped focusing so much on Benjie and looked around me. Our shadows caught my eye. I motioned my friends to look at the ground. The shadows were more like those of three Victorian ladies out on their afternoon ride. From the saddle of a horse, everything seemed so different, majestic and serene. “This is where I come, whenever I feel really mad or really happy,” said the instructor as he gazed at the green tapestry spread before us. Pastures and fields everywhere you looked. The smell of fresh grass filled the air as a cool breeze stirred the leaves on the trees. The sound of silence reigned, broken only by the horses’ grunts and a dog’s bark. Beyond the fields, lay the calm, azure sea that shimmered in the bright sunlight. We stood there, mesmerised, trying to convince ourselves that we were still in Gozo rather than an exotic paradise. Maria and her friends rode with Gozo Stables Horse Riding run by Charlie Muscat. Tel: 79064530. In general, at any stables, a one-hour ride is Euro 20, and 90 mins Euro 30. This applies to tuition in a school as well as hacks. Note that as the ground in Malta is hard, you will walk and trot. It is rare to find suitable space or conditions to canter [unless in a large school]. As group rides cater to mixed abilities, most hacks will be at level suited to the less experienced. Individual rides and tuition can be arranged of course, but may be at a premium rate. 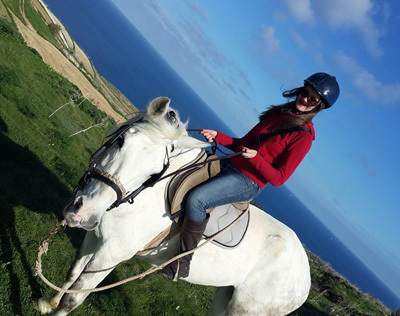 Maltahorseriding.com has useful info on other stables and horse riding equipment suppliers etc and is aimed more at those seeking riding tuition than holiday hacks. Maria Cremona is an MA student of English and the Media at the University of Malta. She researched and wrote this article for an assignment on blogging and travel writing.